Don't these luscious chocolate dipped macaroons make you stop in your tracks? They certainly did around here! One of my dearest friends just celebrated her birthday and I made these for her birthday dessert. They are huge....about the size of an ice cream scoop and are surprisingly easy to make. I stumbled across the recipe somewhere online, as I am ashamed now to say I don't remember where! I highly recommend them if you are a fan of coconut and dark chocolate...think of them as the "ultimate Mounds bar", only far better! So these were a little distraction from my work. We all got together on Monday and celebrated. It was sushi for lunch, then the movies (Julie & Julia, which was a very good movie, by the way), then on to the macaroons. It was a yummy day spent with great friends....now back to work! I have been busy over here and you will see the fruit of that labor very soon. The fall designs are coming along quite nicely, and that is a good thing since printing deadlines will be looming before I know it. The funny thing is that market always has a way of sneaking up on everyone, and this year it is two weeks early, so it is being extra sneaky this year! Anyhow, I think I will be ready without a sweat....thank goodness. 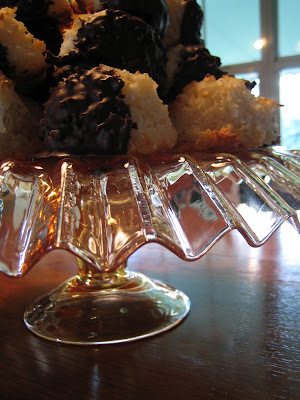 Below is the recipe for these lovely macaroons. Once I figure out how to attach a pdf file for this thing, you will be able to click on it from the sidebar for easy download. Recipe yields 24 large macaroons. (I actually got 30. It probably depends on the size of the scoop) Use an ice cream scoop to make the mounds. Preheat the oven to 325 degrees. Cover cookie sheets with parchment paper. Mix half of the recipe together at a time by placing a bag and a half of coconut in a mixer bowl, along with one half of the remaining ingredients. Mix slowly with a paddle attachment. Once all of the ingredients are well blended, add the remaining half bag of coconut. Mix in and empty the bowl into a very large bowl. Mix the other half of the ingredients in the same way. Add it to the already mixed portion. Use the ice cream scoop and lightly pack the ingredients together so that the macaroon holds together nicely during baking. Place onto the cookie sheets and bake. I was able to place two sheets into my oven on different shelves, so I changed their position halfway through baking to keep the browning even. The original recipe says to bake for a total of 10-12 minutes, but I found I needed longer. I baked for 10 minutes, then moved my pans, and set the timer again for 10 more minutes. You will know when they are done when the bottoms are nicely browned and the tops are lightly toasted. Remove them from the pans to cool on a rack. Once they are completely cooled, they can be dipped in chocolate. Melt the chocolate in a medium bowl in the microwave, stirring after each minute until just melted. Dip the cooled macaroons halfway into the chocolate, then place back onto baking sheets covered with parchment and set in the refrigerator or freezer until the chocolate is set. Now sit back and enjoy the wonderful combination of coconut and chocolate...and as for that diet, think like Scarlet O'Hara....I'll think about that tomorrow!